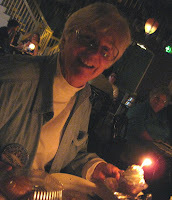 My Wandering Life: Happy Birthday Grandma with the Big Truck! Thanks to Disney's generosity of giving everyone a free ticket to the Disney theme park of their choice on their birthday, we were able to enjoy doing something we haven't done in many years: going to Disneyland with my Mom and Dad! Mom got in for free since it was her big day, and they gave her a button at the ticket booth proclaiming that it was her birthday. This meant nearly everyone we passed call out Happy Birthday Grandma! A great way to celebrate if you like that kind of thing (which I always do!). My parents, the boys, and I got to Disneyland in the morning and then Michael joined us after work. 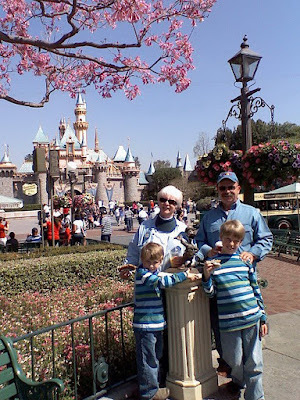 I have fond memories of many happy birthdays spent at Disneyland, and it was nice to be able to celebrate Mom's with my family! We enjoyed lunch at the Blue Bayou (the restaurant inside the Pirates of the Caribbean attraction) where the Monte Cristo sandwich is amazing. The cost of dining there is prohibitive, so we only do it once every couple of years. It may have been Mom's birthday, but it didn't stop the boys from getting presents! 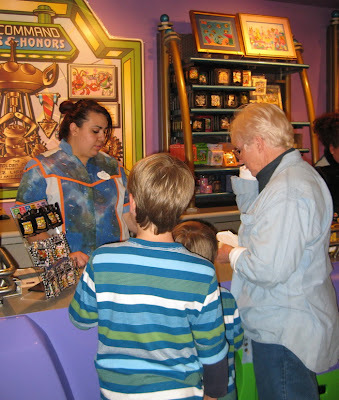 After going on the interactive Buzz Lightyear attraction, Mom bought the boys their own astroblasters to play with after dark. I took a photo of my parents with the boys in front of the castle when we first got there. I really try to make sure to get photos of the kids with their grandparents, as I only have a couple shots with my own grandparents on my Mom's side, and not a single shot with the grandparents on my Dad's side. My big plan was to wait to take the big group shot in front of Sleeping Beauty's Castle until Michael arrived after work. Of course, it was completely forgotten until we were about to leave, well after dark, with sleepy children. 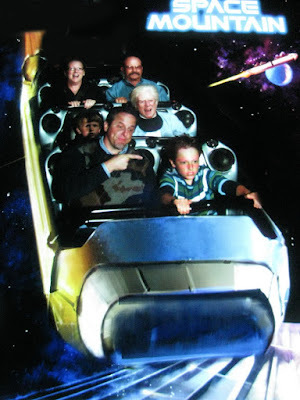 So instead I present the single big family shot of the day... our experience on Space Mountain! Priceless! We finished the big day with a big bang! Several actually! 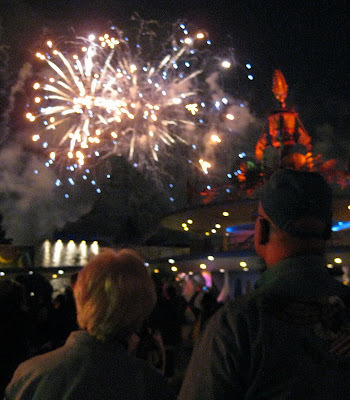 We watched the fireworks display before slipping out and heading home. Happy birthday Grandma! We love you so much!